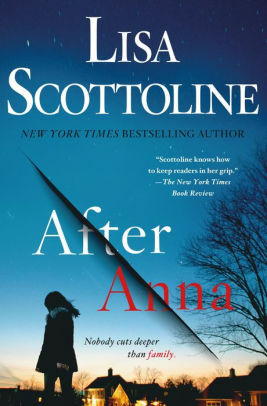 After Anna by Lisa Scottoline is a highly recommended domestic thriller. Maggie Ippoliti is overjoyed to receive a call from her daughter, Anna Desroches, since she hadn't seen or heard from her daughter since she was six months old. After Anna's birth Maggie was suffering from postpartum psychosis. Anna's father Florian Desroches divorced Maggie and immediately moved overseas, cutting Maggie off from all access to her daughter. Anna had also written to her mother saying she wanted nothing to do with her. Now Anna, 17, is attending high school at an exclusive boarding school in the States. Her father, his second wife, and their two children were all killed in a plane crash, leaving Anna alone. She is now reaching out to Maggie, trying to form a relationship and family. Maggie's husband, pediatric allergist Noah Alderman, is supportive and excited for Maggie. She has been a wonderful stepmother to his son, 10-year-old Caleb, who has apraxia. After Anna opens with Noah on trial for Anna's murder and awaiting sentencing, so we know right from the start that this isn't going to be the story of a happy family reunion. The chapters alternate back and forth between when Maggie first received the phone call from Anna and to Noah's trial for murdering Anna. To complicate matters, Maggie's narrative is told in chronological order and move forward in time, while Noah's chapters are told in reverse order and move backward in time. It is also clear at the beginning that Anna is not to be trusted, but that Maggie is too ecstatic to allow any doubts to creep in to the burgeoning relationship. The characters are well-developed. I will admit that at the outset Maggie's over-exuberant, excited and positive exclamations over Anna's sudden phone call and appearance turned me off. Sure, I get it, be happy, but don't lose all sense of caution and discernment. Her actions didn't seem plausible to me. Yes, encourage the relationship, but goodness, use your head, take it slow, and tell Anna you want a relationship with her, but you all need to take the time to get to know each other. Or, if Maggie couldn't do this, Noah should have encouraged her to take some caution. Scottoline is an accomplished author, so she handles with aplomb the complications of her novel and the expected twists and turns leading up to the meeting of the two timelines and on to the conclusion. After Anna is an entertaining story with complications, cliffhangers, and courtroom drama. There are a few plot holes and the ending is a bit of a stretch, but it will entertain and hold your attention throughout.